Personalized pet memorial ornament keeps your pet forever loved and forever remembered. 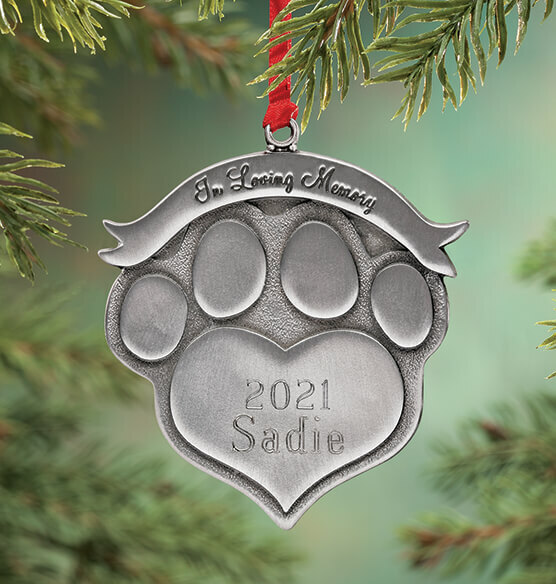 This pet memorial ornament celebrates a loyal friend who's touched your heart. We'll engrave your dog's or cat's name on paw print, beneath the words "In Loving Memory." Specify name; limit 1 line, 8 letters/spaces. Back reads, "You left paw prints on my heart." Pewter. Personalized pet ornament is 2" long x 2 1/2" high. Anyone who has loved and lost a pet knows how difficult it is-and most people I know would not give up the experience of owning a pet even though it is very hard to lose them. I have three of these now for cats I have lost in the last several years. I leave them out year round by hanging them on a knob for a drawer on my breakfront. They are a sweet reminder and looking at the names brings up memories of the cats I have loved and lost. Last year two people I know lost dogs and so I got them each one of these. They were very touched and appreciative of the gift. Cannot recommend these highly enough either for yourself or a friend or family member who has lost a pet. My sister lost her dog who was her best friend and I gave this to her as a gift to put on her Christmas tree and it was the perfect way to remember "Jake" this holiday even though he isn't here with us. Very pleased with the quality of the pieces. 2 others for friends who also lost their best friends. They are beautiful, well made, and durable. This makes a very thoughtful and unique gift for a friend who has lost a beloved pet. Beautiful! I love the sentiment on the back of the ornament. I know this will be one of my most treasured Christmas ornmanents - right along with our children's First Christmas ornmanents. I give these ornaments to a person whose pet has died. The owners of the pet are very moved and appreciative. Since they are a great size, they can ben used as a Christmas tree ornament or a keyring etc. Regardless of how they are used, they seem to bring comfort. I ordered this keepsake ornament for my brother after his pet cat passed away. It is a very attractive and well-made item. The quality is very good, and it would be nice to display all year-round, not just at Christmas. two of my kitties had 9 letter names - one of the names could be shortened; the other cannot. other than that, these are very nice memory ornaments to honor them. This is a great idea. I bought two and had mt cat's name put on them. I'm so glad to have found this. Wolf paw Christmas ornament with our dogs name on it. We lost him to a dog pack that came on our property and killed him. We will always remember this wonderful dog! The pewter ornament is a lasting memento of your special pet. I love the personalization. It was the main selling factor for me. The poem on the back means even more. I have a friend who lost her dogs and I wanted to do something nice for her so I gave her the memory ornnaments. She was so happy to have them and she loved them. They are very nice and something she can keep to remember them forever. I also got one for my sons family when they had to put their beloved dog down. It is truly a wonderful gift. Thank You! It's a sturdy ornament, and with our pet's name and date, a very meaningful addition to our Christmas Tree. Bought this in memory of my Granddog Garth. A beautiful tribute. I bought one several years ago for his brother Bud and just had to have one for Garth. I gave them to their Mom and Dad.. This ornament is a tasteful way to remember an important member of your family who has crossed THE RAINBOW BRIDGE. This ornament allows us to have this kitty always with us. We always have our kitty with us at Christmas as he was for 19 years. Got one for Christmas for my aunt, whose cat just passed away. Smaller than expected, but still very nice. I have ordered several of these ornaments over the years and have always been completely satisfied. They are of excellent quality and a wonderful way to remember those furry family members who are no longer with us. They are elegant, unique and wonderfully executed. Very nice to use in remembering a deceased pet. Love the ornament. Very satisfied!! We lost our beloved pet a year ago. When this came in with his name engraved and the beautiful inscription, it made us cry. Nicely engraved and a great remembrance of a great dog. Just received my Memorial ornament and love it! Made very well and will last forever. this is very great cause i bought it for my aunt who lost a dog who she had since it was a puppy so this will tell her that he is with her all the time. Several people have asked me where I purchased it. Got one of these for my son for his Christmas tree. His faithful dog of 16 years died a few months ago and he was thrilled with the ornament. This is a really nice ornament that makes a grea gift. I purchased this ornament in memory of my beloved dog. It is a quality piece. The engraving is lovely and it arrived in a timely manner. We lost our dog in August. This ornament will be a beautiful reminder of him. It is sturdily made, the print is clear and easy to read. I know my husband will be touched when he sees it. You could actually leave it out all year long, not only at Christmas. A beautiful way to memorialize a beloved pet. Made my friend whose dog recently died feel better to honor her dog in this way. We have lost 2 very special, much-loved cats and these ornaments are great for remembering them. Purchased item to place on Christmas tree. When I received it , I realized it needed to be out all the time. I found a minitature photo stand to place it on. It stands next to a photo of our deceased pet. Very precious item. Over the years I have purchased several of these ornaments for family/friends who lost their pets during the year. I generally purchase this ornament the first Christmas after the death. Everyone is very moved by the ornament and very appreciative. I am so happy that the year has been added. I am very satisfied. I miss my cat so bad, and this is a way to remember her at Christmas time. Thanks so much. I bought myself one of these ornaments when my dog died. I hang it on my tree every year. Thought my daughter and her boyfriend could put it in there truck, to keep the memories of there dog close to them. I have given these to friends who have lost their pet and they are displayed in the home year round. This is a beautiful, hi-quality item. My only negative is when a pet passes away, you want the ornament right now, not at Christmas. I wish these were available year round. Wonderful!!! A little on the heavy side but other than that it's perfect. The ornament was high quality and a beautiful memorial to those fur-babies that have been lost. I gave this ornament to my daughter who lost her precious cat this past June. She loves it and put it on her Christmas tree to remember Flanders. Beautiful ornament. Very well made. thank you. This is my first Christmas without my four-legged buddy, who passed away in April. It has been very hard to let go, and this engraved ornament is the perfect way to still include him in Christmas! I lost my little dog Lucy last Christmas Eve to lung cancer and this is a beautiful and precious reminder of her. The detailing is lovely. Thank you. Memorial metal placed by my dogs picture. In memory of the best of the best. Something to help make it through first Christmas without pet. Very nice quality, perfect memorial for a beloved pet. I have bought many of these. Be sure to check dates. I bought multiple and the year goes to the default. I did not catch it when I was sent the confirmation email. I had to order & pay for a correct one to get the right date. We were wanting a way to Memorialize our two pets that passed within ten months of one another and another pet that passed a few years ago....it was just what we were looking for and a way to remember our felines forever! I was so pleased with this ornament I bought one for my sister who recently lost her dog just before Christmas. What a great way to always have your pet remembered year after year during the Holidays. I use the product to remind myself of our dear pet, Molly. Every year we got an ornament for her, and this is her newest ornament. I have given several of these as gifts to friends and family who have lost their beloved pets and they have loved them. Thanks for having this product for those of us who love our pets and appreciate having a remind when they are gone. This was my first purchase from Miles Kimball and I am very pleased with it. It is well made and the metal it is made from has a nice weight to it. The engraving was well done and very legible. This was a gift for my daughter and she thought it was beautiful. A good purchase as something nice to keep or to give as a gift. I ordered the pet ornaments around the Thanksgiving holiday time so they could put them on their tree. They were much better than I expected and they will last forever. I had 3 people in my family who had lost pets so I was so thrilled to find something so special and unique. Perfect,everything was just as pictured. Great for a gift of things remembered. This is a great idea for someone who has lost their family member aka, pet. I have bought so many of these over the years and am always satisfied with the ornament. We lost our beloved Casey this year and was looking for a beautiful ornament to put on our tree as we did every year for him. This ornament is well made and beautiful as well. Although it has a very nice saying on the back, I wish it could have been personalized with our own saying. We recently and sadly said farewell to our pup on her final journey, and I wanted a simple reminder that she is certainly not forgotten, but a forever part of our family. This is a simple but beautiful token to do so. We display our paw prints 365 days a year on our illuminated tree. I feel that they are a wonderful reminder of very SPECIAL COMPANIONS. I have two friends that lossed their doggies right before Christmas. I know how our pets are part of our families, I wanted to give something special to remember their pet and this was perfect. It was elegantt, not tacky at all. The quote on the back is so sweet. I gave it to my two friends and they both loved it ! We lost our precious dog in August. This ornament will be a reminder of our boy, whom we miss terribly. It is well made, the print is easy to read. It will be with us for many, many years. It was a nice Christmas present as a memorial to the pets that were lost. Have given the ornament to family and friends. Children even seem to like it. I got this to use as a christmas tree ornament and it worked wonderfully for that purpose. It is perhaps a bit heavy, but since I always put memorials on upper branches it wasn't a problem. I do think it will last for a good long while, and is of a quality it could be left out if you so desired. I guess my one complaint is that they only put the name in all caps. I'd love to see these where they do the name exactly as we order it! The pet memorial is a nice keepsake and remembrance for a beloved pet that has passed. It can be hung on a Christmas tree, but can be hung anywhere because it is not "Christmasy". It is nicely done but I wish the name could be a bit darker so it would be easier to read. In all it is well- made. Very pleased with this ornament! A few years ago, I had several of these memorials engraved w/ the names of pets my siblings had lost over the years and gave them as Christmas presents. That year I touched their hearts in a very loving way! I'd also ordered three for myself w/ names of my most recently lost pets which I hung on my Norfolk Pine houseplant so they're out all year long rather than decorating the Christmas tree once a year. I swore then that I'd order more for the other pets I'd lost from childhood on--which I recently did. The shape of the memorial has changed some since my first order. While I do appreciate the option of being able to identify the year of loss, I really don't like the sharper, more pointed bottom nor the heavier weight. My preference is the earlier shape. I bought this item for my daughter, who lost her cat this year. She thought it was a nice touch on the Christmas tree. Like many others said, the engraving is much too light. Very nice for our tree to remember our wonderf Jack. We have many ornaments on our tree reminding us of family and family events. These pet memorials will be a nice addition, although they are a bit heavy. The personalization of pet name and date needs to have a color added. It is silver on silver so is difficult to see. I brought this memorial ornament for my neighbors who lost their dog "Rocky" early summer 2017. They really liked it and appreciated that I thought of them especially since this was their first Christmas in 14 years without their beloved pet. I just wished that the engraving of his name was more visible. Wish the ribbon had been slightly longer or already looped for hanging. Looks very nice and the quality is better than I expected. This is a touching and beautiful way to honor and remember your pet(s) - not that you would ever forget. It can be placed on the tree at Christmas and then used in a special place the rest of the year. Loved it but smalled then expected. Nice little momento to remember a family pet. Heavy enough to hang on a wall by a picture. The ornament is nice, But the engraving is much lighter than it was in the past, it is hard to read. I hope they go back to the engraving they used to use. The writing on the ornament is not at all as it appears in the photo. The writing is dull and hard to read, almost looks like there is no writing, have to look real close to see what is written on it. The only writing that stands out is the "In Loving Memory"
The lettering isn't as shown in picture...it is very light & hard to see. Ordered this as x-mas gift for friend.[...] Ornament is nice idea but rather small. Had several flaws in the metal that made it look cheap. Its a bit over priced in my opinion. I like the ornament, but name and date should be darker so you can see it better. I loved this ornament for my daughter whose dog passed away recently. The quality of material and size is good. However, the year and name engraved came out so light, you could hardly see it. Looked like the stain or antiqueing that should have been rubbed over it to make it stand out, wasn't. I called, and a replacement was sent with no charge but looked the same way. Perhaps the engraving needs to be deeper and then filled in with the same process as the top that reads " In Loving Memory". I would order it without the engraving and write on the front myself in permanent marker. The ornament is very durable and attractive but I can barely see the engraving so I was a bit disappointed. I'm especially disappointed because I compared it to the engraving on a similar ornament I ordered last year when we lost our first dog. The difference in the engraving on each of the ornaments is like night and day. Bring back the 2013 version or press harder on the engraving machine. I have previously ordered three of these memorial ornaments and was satisfied. I recently ordered two and am disappointed in the engraving. Earlier ones were easy to read; last two very difficult to read. Engraving was like what would be on a charm, not an ornament. Perhaps you have changed engraving companies. I would be hesitant to order again. I will have to think carefully about purchasing again. I bought these pet memorial ornament in the past and loved them. The past two years I have bought for family members as they lost their pets. Can not read the engraving. VERY disappointed. I have 4 of these from previous years & the quality is much better. We ordered this as a gift for our daughter 12/7.As of 1/2 she still doesn't have it and and after contacting Miles Kimball were told they don't know when they will get it in to send to our daughter. Very disappointed to say the least. Over the years I have purchased many of these ornaments for friends and family who have lost pets during the year. I have always been so pleased with the ornament. In previous years, the pet's name and date were in black and easy to read. However, this year, they have changed the ornament so that the name and date are engraved with no coloring and it is very light and difficult to read. Very disappointing. Because it is engraved, it cannot be returned. Too bad they don't give a better description! I was disappointed when I received the ornament in the mail, the engraving is so light that you can hardly read the name. You have to hold it in the light just right in order to read it. Would of said is was great if engraving was easy to see. The ornament itself is very cute and will bring back good memories of the pet. However, it has an air pocket (during molding) defect and it is going to cost ME to send it back and get a new one. It is a very obvious defect and I am not sure why they would send it like that. Therefore, I will not be purchasing another one. Customer service needs to improve. After purchasing five of these ornaments in the past, I had to make another purchase of this ornament after losing a beloved pet, and the top left ornament in the picture is what I received. Was told they upgraded there personalizing machine so that is why the new ornament looks the way it does. I thought upgrades were meant to make the products better, not look like garbage. Very disappointing. I never received item with my order. Called and they were going to send a replacement that they said i would receive this past Friday. Never received so i called to check on it and they said the item was no longer available. Not very happy with that! Not the same as they use to be. I had ordered quite a few of these in the past and was always very happy. But apparently they have changed their supplier. The paw is now a different shape and a little larger. However, my biggest problem, like so many other reviewers, is the engraving. It is barely visible. I won't be ordering anymore. I cannot give you any pros or cons because I've NEVER received my product!! I ordered this on 12/14 and so far I've gotten 2 confirmation emails for the order, but NO PRODUCT!! !